The definition of invisible is “unable to be seen; not visible to the naked eye.” Fibromyalgia is often called an invisible condition because people suffering from it don’t look sick. But we feel it. Marked by widespread pain and fatigue, sleeping issues, and “fibrofog,” many people with this condition put on their happy face and go about their day, all the while suffering in silence. We call ourselves FibroWarriors. Here’s a link to 14 Invisible Illnesses you may not be aware of. There was a video contest earlier this year to help raise awareness of these kinds of chronic conditions, as part of the #IAmInvisibleNoMore campaign, by the Invisible Disabilities Association (IDA). And there is also an #InvisibleDisabilitiesWeek in October to raise awareness of all kinds of conditions that aren’t necessarily visible. 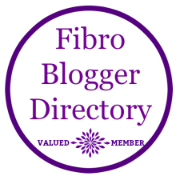 To learn more about my condition, visit www.fibrobloggerdirectory.com to find many other wonderful bloggers living with this and other invisible illnesses. “Living with an invisible disability means struggling to get people to believe you when you explain how your condition affects you.” Wayne Connell, founder and CEO of IDA. So its never safe to assume that just because someone always looks alright on the outside you know what’s really going on with them. Lady Gaga had to cancel shows on her tour due to her chronic pain. And, sure, there were plenty of critics who don’t understand and question her situation. But there are thousands more who can relate to her pain and what she endures to get through her day. It may take me two or three times as long to get ready in the morning as it used to. It hurts to raise my arms to do my hair. My hands don’t work as well as they once did. So as you go through your day, please consider what others might be going through. Smile, be kind, and try to understand those who suffer in silence with their invisible conditions. Please comment if you too have an invisible illness. Share your experience so we can all be a little more understanding, kind, and spread some love. Great post & nodding yes as I read! Lady Gaga is a compelling case, even when she doesn’t have to cancel a concert. People see her when she is in the public eye doing something but forget that all the time away from the cameras she is no doubt having to rest and have therapies. It would be easy to envy the fact she can afford the treatments much easier but realistically I would rather live on a modest income without the life in the public eye.